Breakfast is the most important meal of the day, right? And therefore it should always be a priority. Unfortunately, sometimes we get caught up in the hustle and bustle of a rushed morning and maybe all we do is grab a granola bar and coffee. That’s sad (but at least there’s coffee). It’s easy to do, and society doesn’t help in our effort to savor and enjoy a good and hearty (and healthy) breakfast. Instead every fast food joint offers a greasy egg, bacon, and cheese croissant with a side of hash browns to help you start your day in a grease and carb coma. Or you could grab a double chocolate chip “muffin” with your latte at the coffee shop. All that cupcake is really missing is frosting and a birthday candle. These convenience foods can fill a gap in a pinch, but to rely on them is to put my energy and health in the hands of a short-order cook or a far away delivering bakery. This rant about the high priority of breakfast may come off as slightly odd given my not so distant post about bringing hard boiled eggs, muffins and fruit to New York for all 3 breakfasts. But hear me out. My point is that breakfast is important, breakfast should promote your health and energy for the day, and it should be delicious. Our New York breakfasts fit all three criteria, (even if it wasn’t the most interesting breakfast by day 3) and so did today’s. Today’s was awesome. It all started with half a mini green pepper and a mini red onion, both from last week’s CSA share. 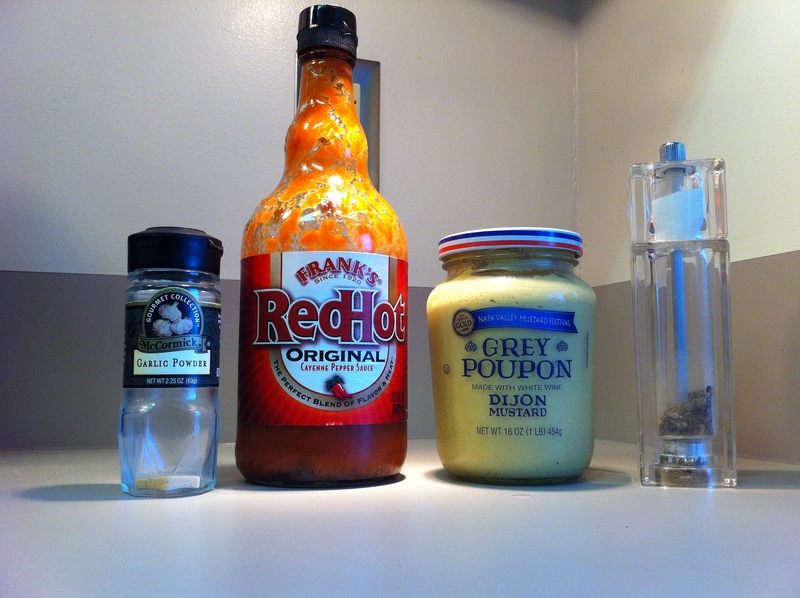 Add to that a little garlic powder, hot sauce, and Dijon mustard loving, all seasoned nicely with a little salt and pepper. 1. Saute 1/2 cup diced green pepper and 1/4 cup diced red onion in a tablespoon of olive oil until they are soft and just starting to brown, about 5 minutes. 2. Meanwhile, beat 3 eggs with 1/4 tsp garlic powder, 1/2 tsp hot sauce (or more depending on your preference) and about a 1/2 tsp Dijon mustard. Season with salt and pepper and add a splash of cold milk or water if you like ’em fluffy. 3. 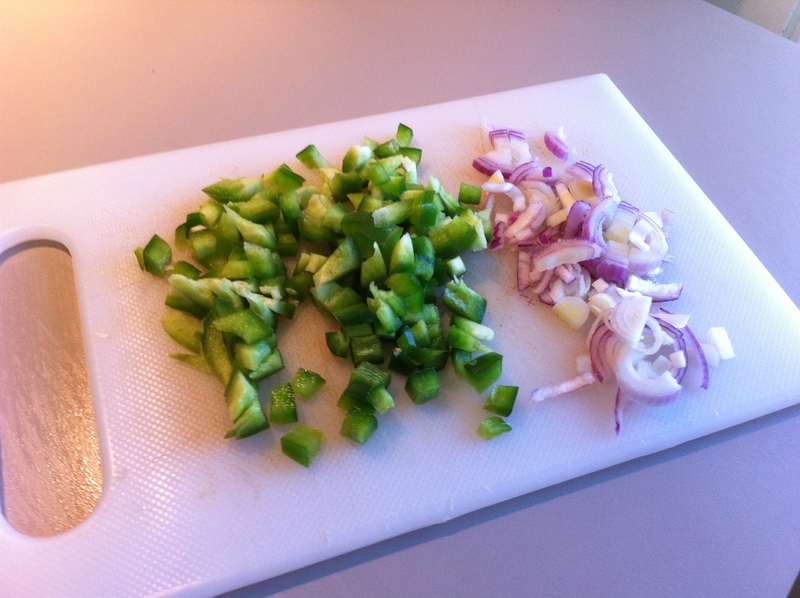 Pour the egg mixture over the green pepper and onions and scramble your eggs. 4. As the eggs cook, toast 2 thin bagels, nuke some fake sausages, and wash a couple big leaves of spinach (also from our CSA) to prepare your sandwich landing zone. You can’t tell me the McDonald’s drive through looks better than that! If you can eat dairy products, I imagine a smattering of cheese would be divine here, too. The husband’s only complaint was that he could handle more hot sauce. What’s your favorite breakfast to make when you have more than 15 minutes? I adore eggs. My favorite are poached and hard boiled. i love to make a warm avocado sauce to poor over them and of course, your husband’s idea of hot sauce too! I can personally vouch for this meal. It was excellent. 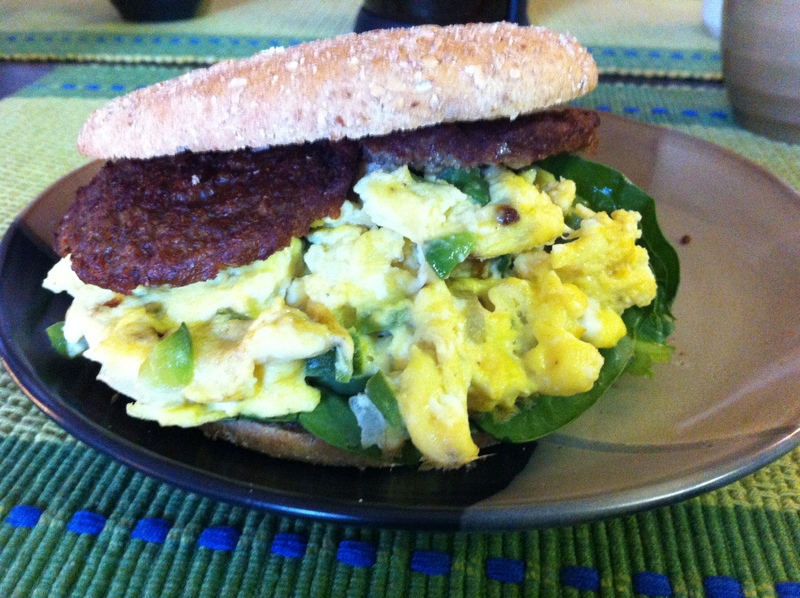 The crunch of the spinach mixed with the delicious egg blend was perfect!